The Kingdom of Saxony is territorially speaking the continuation of the Margraviate of Meissen which was created around 970 against the slavic Sorbs. Count Rikdag (+ 985) was the first Margrave. He was succeeded after his death by Ekkerhard I (+ 1002) of the Ekkehardinger. With his son Ekkehard II his line died out in 1046. After him the Margraviate was held by the Counts of Weimar and Orlamünde and the Counts of Brunswick, until Heinrich of Wettin (1070-1103), already Margrave of the Ostmark (since 1046 in possession of the Wettin dynasty) and Lusatia was granted Meissen in 1089. Heinrich III Margrave of Meissen (ca. 1215-1288) added Thüringen in 1242. Friedrich IV Margrave of Meissen (1370-1428) was awarded in 1423 the vacant Electorate of Saxony-Wittenberg for his support of the Emperor. The sons of Elector Friedrich II, Ernst and Albert divided the possessions. Ernst became Elector of Saxony and received Wittenberg, southern Thuringia and Vogtland, he is the ancestor of the Dukes of Saxe-Altenburg, Saxe-Coburg-Gotha (Kings of Belgium, Bulgaria and Great Britain and Northern Ireland) and Saxe-Meiningen and the Grandduke of Saxe-Weimar. Albert became Duke of Saxony and received Meissen. In 1485 the capital was transferred to Dresden. In 1547 his descendant Moritz Duke of Saxony (1521-1553) recieved the Electoral title and acquired part of the Wittenberg lands. Friedrich August I Elector of Saxony (1670-1733) was elected King of Poland and Grandduke of Lithuania in 1697 as Augustus II, as was his son Friedrich August II/Augustus III. In 1806 the Elector of Saxony took the title King after the end of the Holy Roman Empire. Saxony lost half of its territory to Prussia in 1814 because of supporting Napoleon. On 13-11-1918 the last King abdicated. The oldest proven ancestor of the Wettin dynasty is Dietrich Count in the Liesgau (+ before 976/77). 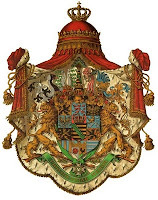 With the death of Maria Emanuel Margrave of Meissen July 23rd 2012, the son of his sister, Alexander Afif, according to a family pact of 20-5-1997 succeeded as new head of the Royal Family of Saxony. The Afif family is of Lebanese, Maronite christian, origin. 64. Pierre Afif * ca. 1770 + 1850; Zn van Essaf A. 102. Joseph Anton Johann Aartshertog van Oostenrijk * Florence 9-3-1776 + Ofen 13-1-1847; Paladijn van Hongarije; Zn van Leopold II Keizer van Duitsland en Maria Luisa Infante van Spanje = 92. 103. Maria Dorothea Hertogin van Württemberg * Carlsruhe 1-11-1797 + Buda 30-3-1855; Dr van Ludwig Hertog van W. en Henriette Prinses van Nassau-Weilburg = 93. 112. Leopoldo II Johann Joseph Franz Ferdinand Groothertog van Toscane, Aartshertog van Oostenrijk abdicatie 21-7-1859 * Florence 3-10-1797 + Schloß Brandeis 29-1-1870; Zn van Ferdinando III Groothertog van T. en Aartshertog van O. en Luisa Prinses van Napels en Sicilië = 66. 118. Maximilian Joseph Hertog in Beieren * Bamberg 4-12-1808 + München 15-11-1888; Zn van Pius Hertog in B. en Amalie Prinses en Hertogin van Arenberg = 90. 119. Ludowika Wilhelmine Prinses van Beieren * München 30-8-1808 + München 26-1-1892; Dr van Maximilian I Koning van B. en Caroline Prinses van Baden = 91.